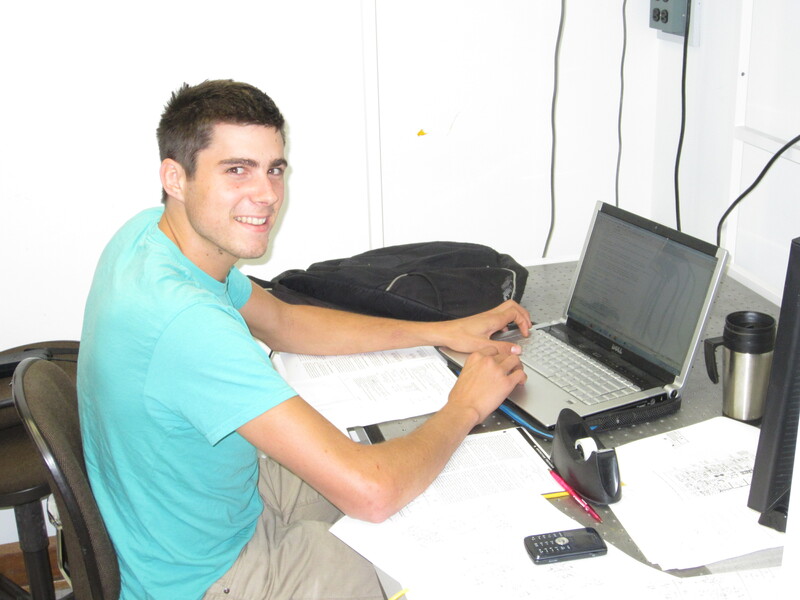 Interns also provide valuable input by contributing to the write-ups for the experiments. This program benefits both the student interns and all students who take the Physics 111 course. 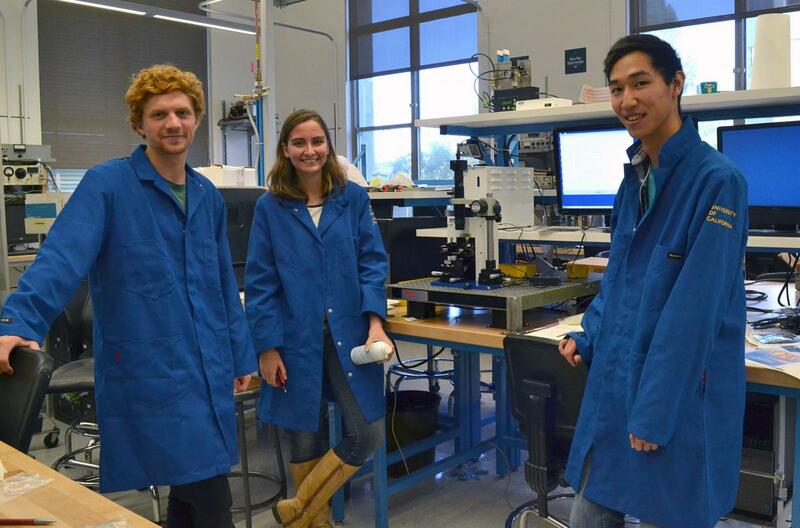 Interns learn in-depth about the experiments they work on, gain skills in building the apparatus and testing complex systems as they would in a research lab, and build confidence in their ability to do science. 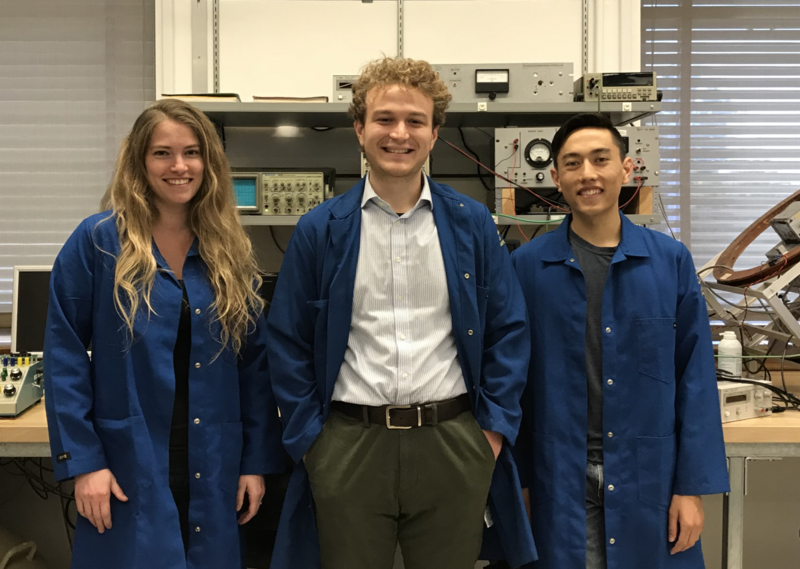 In the Physics 111 lab, virtually every experiment has been influenced by the hard work of these interns, who provide the perspective only a student can give on how to make an experiment understandable, meaningful, and feasible for students taking the course. 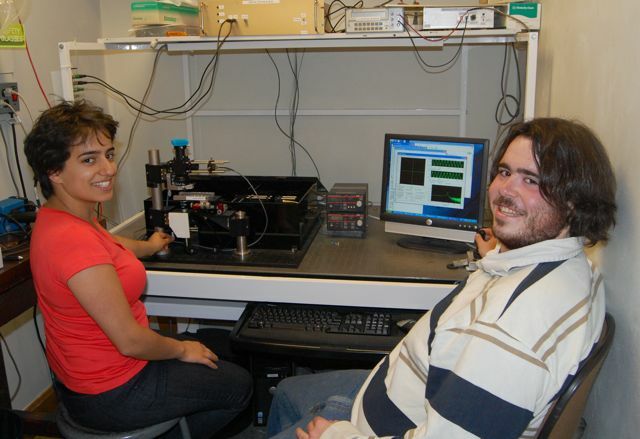 The quality of this course absolutely depends on the participation of students in development of experiments. The Physics Department gratefully acknowledges the generous gifts of Douglas C. Giancoli that have made this internship possible. In Memory of Emilo Segrè. This award is given in memory of Emilio Segrè (1905-1989). Born in 1905, Segrè was the first student to earn his doctoral degree under the sponsorship of Italian physicist Enrico Fermi, his friend and collaborator for more than three decades. Upon immigrating to this country in 1938 (he later became an U.S. citizen), Segrè accepted a position at the University of California, Berkeley. There, he commenced one of his most productive periods in nuclear physics, working with Glenn Seaborg, a chemistry professor, on methods of separating nuclear isomers. In the period following World War II, the anti-proton, an atomic particle that sought to prove nature’s symmetry still eluded scientists. In 1955, using Berkeley’s powerful new cyclotron, Owen Chamberlain and Emilio Segrè made the first observation of the anti-proton. This discovery signaled a major leap in the study of matter and anti-matter. 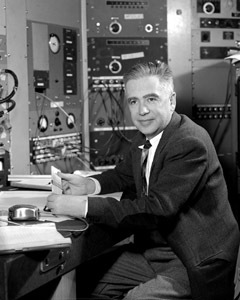 Emilio G. Segrè received the Nobel Prize in 1959 for his work with Anti-Protons. For a delightful biographical sketch of Emilio Segrè by UC Berkeley Professor J. David Jackson, see the National Academies Press site. 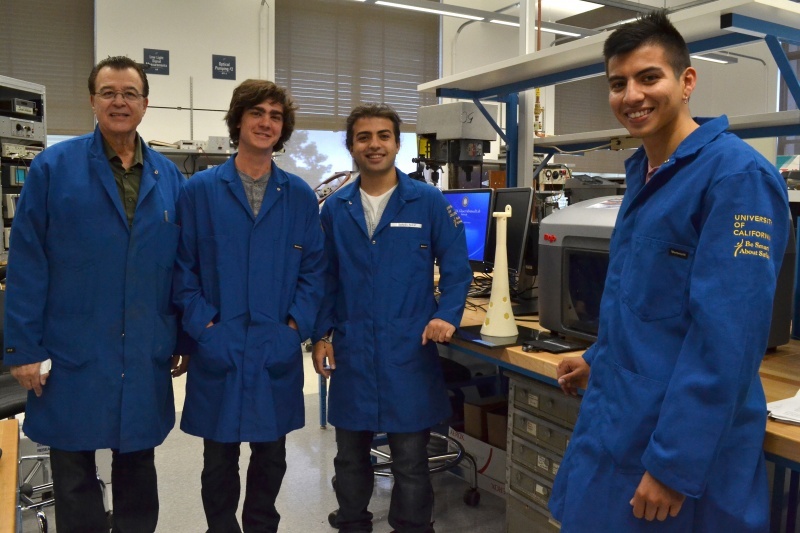 Applications from current UC Physics undergraduate and graduate students are accepted in April of each year. Note: That this award WILL affect a recipient's financial aid. Please check with Claudia in (368 LeConte Hall) and the Financial Aid Office, 211 Sproul Hall, for more information. Your application should be submitted by the deadline of May 4th for the Summer of 2018, the Segre Internship will run from June 11th through August 6th (with one holiday for Independence Day). A stipend of $4,500 is provided for the internship. To apply for the Segrè Internship, print the flyer and application form 2018 application form , fill it out, and submit it to Winthrop Williams in the Physics 111 lab. Make training videos for equipment and experiments. Making & developing new interactive Pre-Lab questions. Work on Beta Ray experiment to modify and get operational. Improve and change the Magneto Optical experiment; Mount, move, & re align optics to improve the experiment. Optical Laser Tweezers. 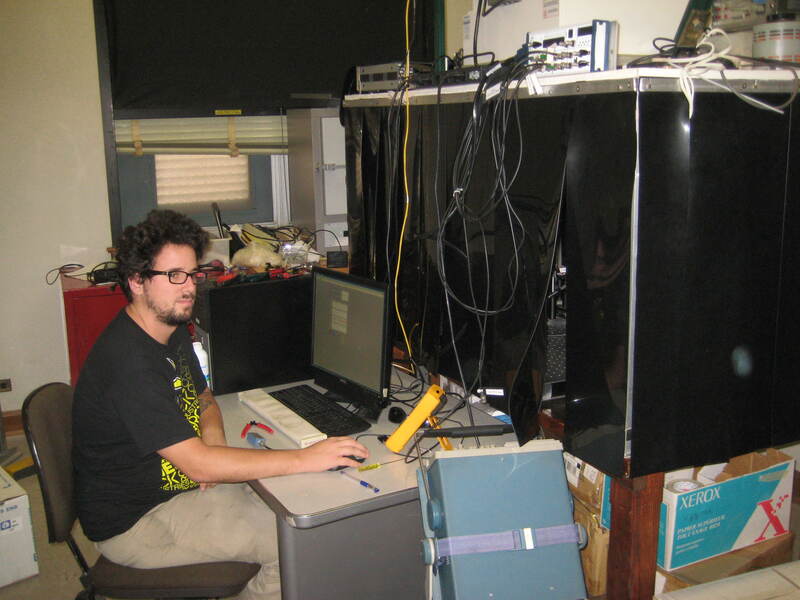 Disassemble the whole complete Optical Trapping experiment and re-assemble it in the new location. Work on BSC breadboards redesign them and build new ones. Work on improving the advanced Lab write-ups. Work on improving other parts of the 111-Lab as needed to make room for new experiments. 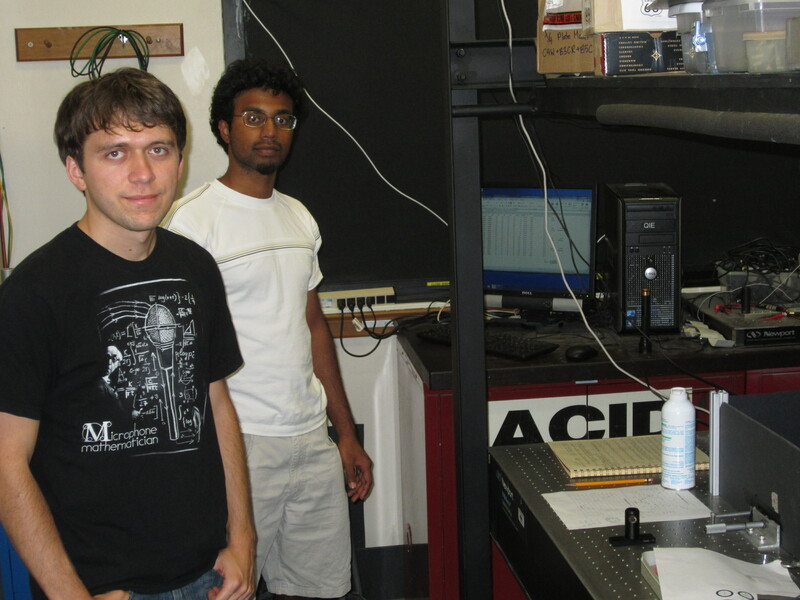 They worked on modifying many experiments in the 111-Lab during the summer renovations. Worked on the new Websites development of Instrumentation Lab and Experimentation Lab, code and content. Re-designed the Magneto Optical experiment adding a new structure and 4x8 air table for equipment, Installing new coil driver unit. 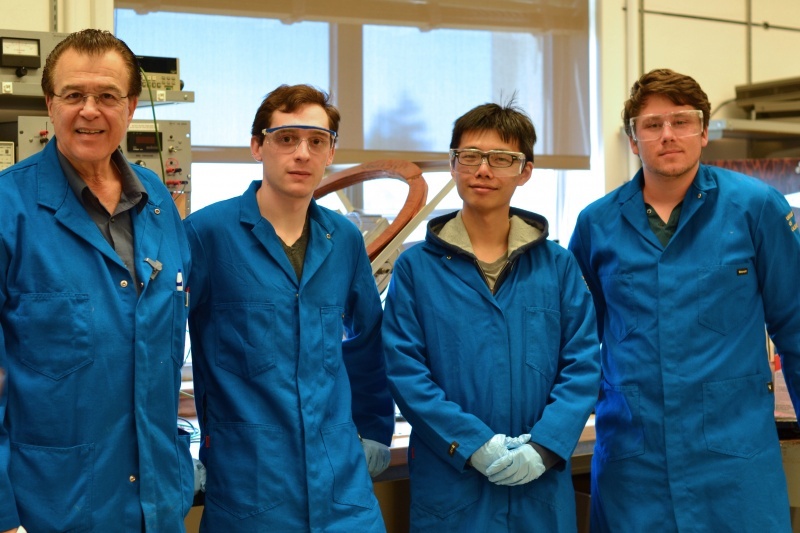 These three Segre interns, Cliff, Sergiy, and Toni worked together on many experiments during the final stages of the 111-Lab renovations. Cliff Chen works on the NMR experiment. Modifying of Gamma Ray, Muon Lifetime, Atomic Physics, NMR, Brownian Motion in Cells, Low Light Signals, Magneto Optical, Semiconductor Hall Effect, Non-Linear Dynamics, Rutherford, Quantum Interference and Entanglement, and Atom Trapping. 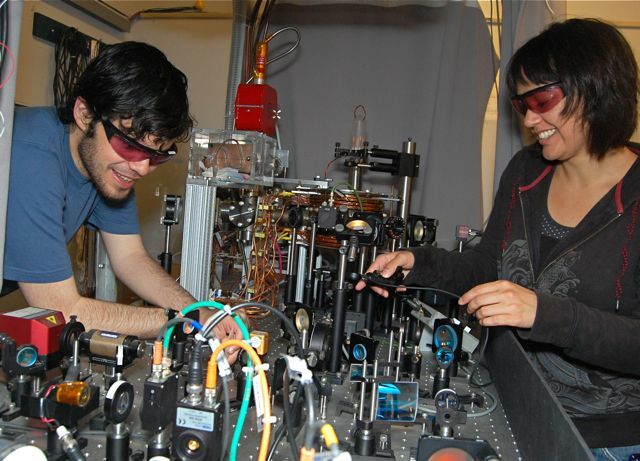 They worked on the Optical Trap, Instrumentation Lab experiments, and Quantum Interference and Entanglement. Thanks to an increase in the annual donation from alumnus and author Douglas Giancoi (BA '60, PhD '66), the Department of Physics was able to offer three internships instead of the usual two. 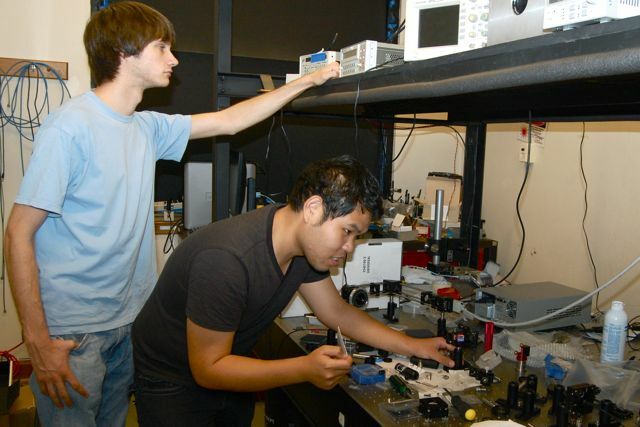 The summer’s biggest project was a new experiment called Quantum Interference and Entanglement. 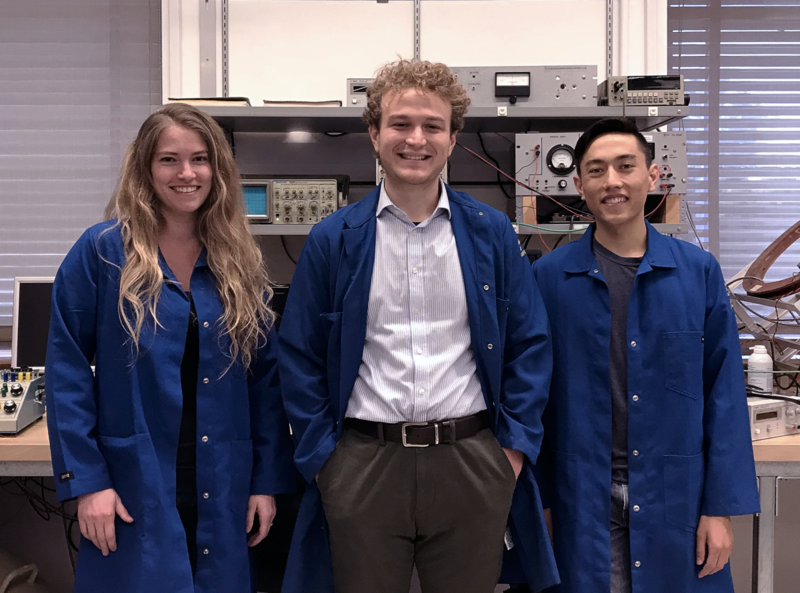 The experiment is related to professor Häffner’s research in quantum computing (see page 4), and additional support for its development came from Häffner’s National Science Foundation Career Award and a donation from alumnus Hans Mark (BA ’51). 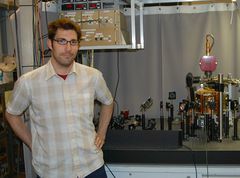 The experiment creates entangled pairs of photons and demonstrates the phenomenon Einstein called “spooky action at a distance.” In the Advanced Lab, students will observe this effect and find that nature violates either the concept of locality or the principle that properties of objects might be ill-defined, such as in quantum mechanics. William Morong tested the single photon detectors, designed the power supply for them, developed software to handle the data and, with help from Bennett Sodergren, assembled the optical components. Guillermo Fong led a substantial upgrade of the Compton Scattering Experiment, which had remained virtually unchanged since its creation 37 years ago. 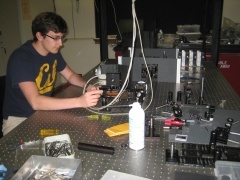 He tested a new Cd-Te X-ray detector that replaces the massive old Dewar-mounted detector with a single pocket-sized unit, and designed and fabricated a new apparatus that will allow students to test a variety of scattering targets. The new experiment gives students more options for creatively exploring the Compton effect and analyzing results at higher resolution. 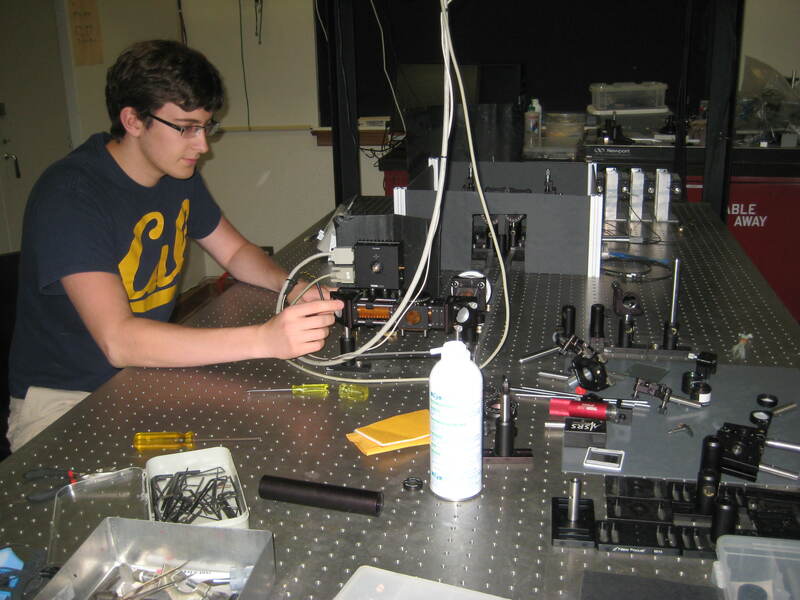 Bennett Sodergren began the summer by tearing apart the laser tweezers experiment, down to the bare breadboard. 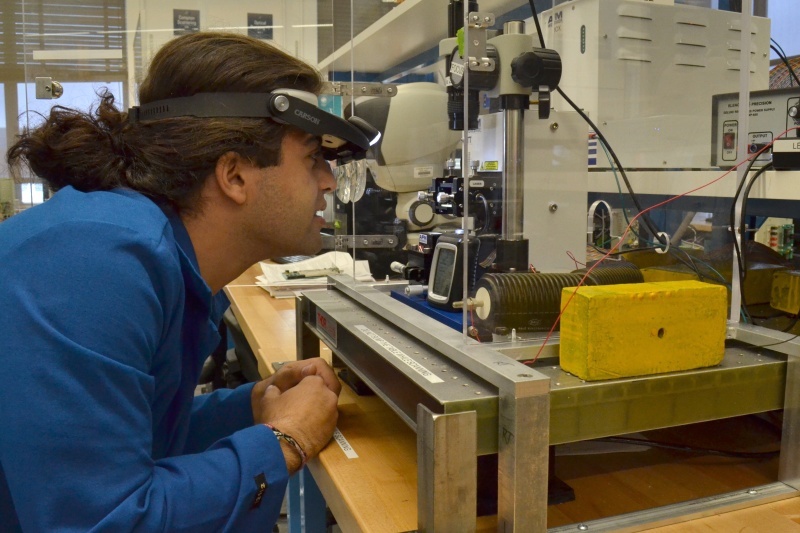 He rebuilt the microscope and beam path in a modular cage system that allows easier alignment and shields the beam without restricting access to the controls. 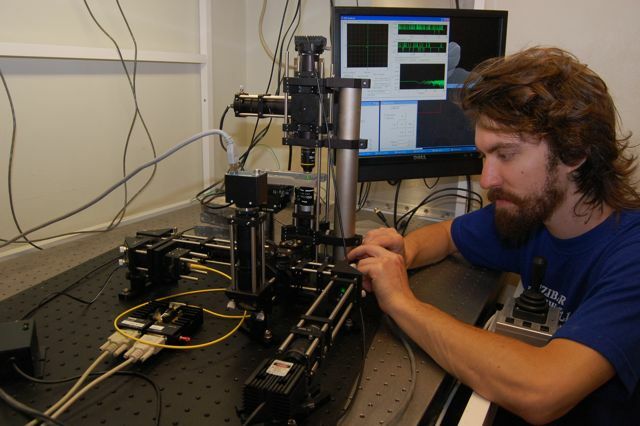 He designed and assembled a second laser beam path to add capability for fluorescence microscopy. 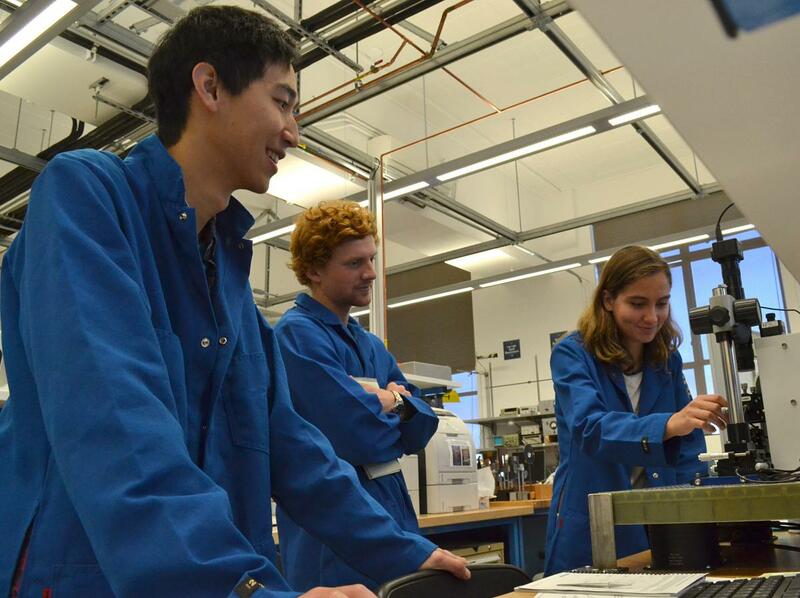 Students will use the new equipment to measure the stalling forces of single kinesin motor molecules, an experiment that comes from professor Yildiz’s biophysics research. 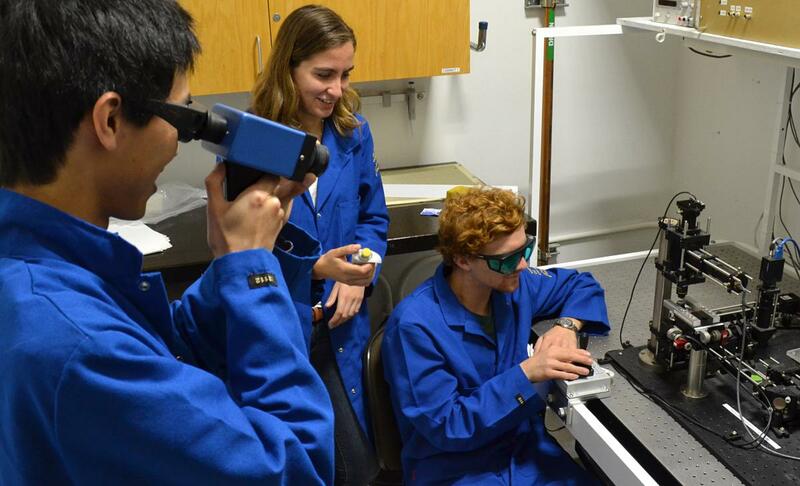 Students will use the laser tweezers to maneuver a kinesin coated bead onto a fluorescent-labeled bundle of microtubules, then measure the force developed by the kinesin molecule as it pulls the bead along the microtubules. Justin and Cassie working on atom trapping. 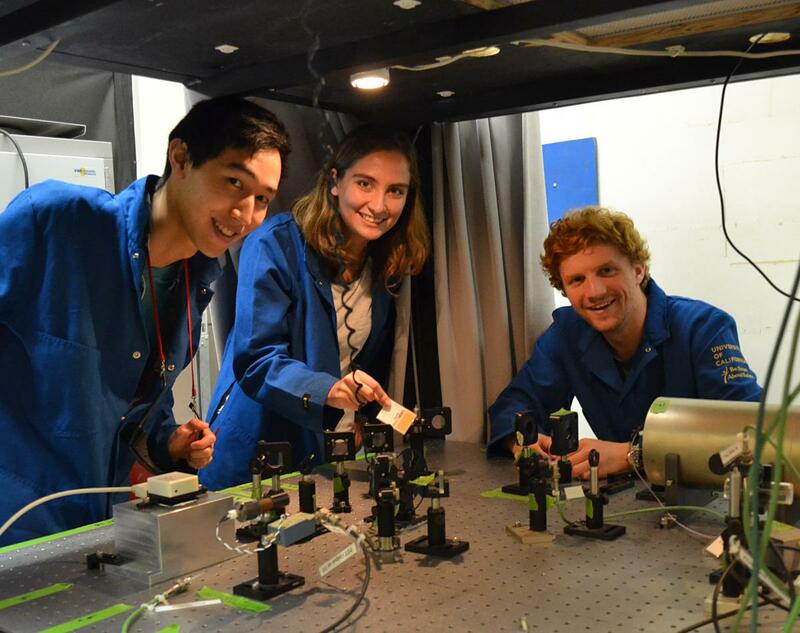 Undergraduates Cassie Reuter and Justin Ellin worked all summer to improve the lab’s new Atom Trapping experiment. During the experiment’s first year of use, students could not consistently achieve a reliable magneto optical trap (MOT). Justin and Cassie painstakingly analyzed the behavior of the system and devised a straightforward procedure that works. The new procedure requires students to generate absorption spectra for Rubidium (Rb) lines and derive an error signal based on the Rb spectra. Students then use this error signal to tune the two servo controllers to lock the laser frequency. With the clear, well illustrated instructions provided by Cassie and Justin, students are now able to reliably generate a MOT after a few days of hard work. Success is rewarded when the trapped atoms appear as a ball of bright fluorescence in the center of the vacuum chamber. Once this milestone is achieved, students can pursue other investigations that were previously out of reach. They can study the sensitivity of the MOT to changes in beam size and alignment, beam polarization, beam power balance, and magnetic field gradient. They can tie these results to the underlying atomic physics. 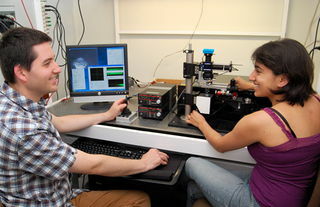 By interrupting the laser beam for varying periods to observe the decay and loading of the trapped atoms, students can measure the number of atoms trapped and their temperature. So far, students have achieved temperatures as low as 100 milliKelvin, or one-tenth of a Kelvin. Besides working out new procedures, Cassie and Justin modified the apparatus and software to make the new investigations possible. 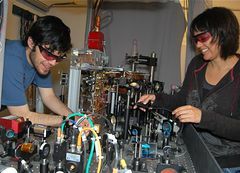 They revised the beam path through the Dichroic Atomic Vapor Laser Lock (DAVLL), which allows measurement of the laser’s frequency, reassembled the vacuum apparatus, and realigned many of the optics. They wrote a new program in LabView to control and take data from the experiment, incorporating many new features that will benefit students. Among the tasks the 2009 group accomplished were upgrading the Muon Lifetime experiment with a second photo multiplier tube, testing and troubleshooting the optical trapping experiment, modifying and pilot testing lab software, completing an atom trapping experiment, and improving the Semiconductor Hall Effect experiment. The major milestone of the summer was achieving a viable atom trapping experiment. They added a set of permanent magnets to create a uniform magnetic field around the Dichroic Atomic Vapor Laser Lock (DAVLL). This involved modeling the magnetic field with Mathematica to optimize the spacing of magnets, machining aluminum magnet mounts on a mill, and aligning the laser beams through the DAVLL. 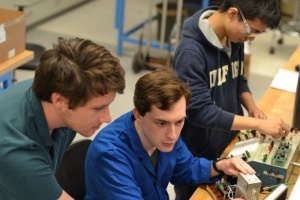 They built a voltage divider to replace two amplifiers, which included modeling the circuit, prototyping it on a breadboard, and building the final unit by soldering components on a circuit board. 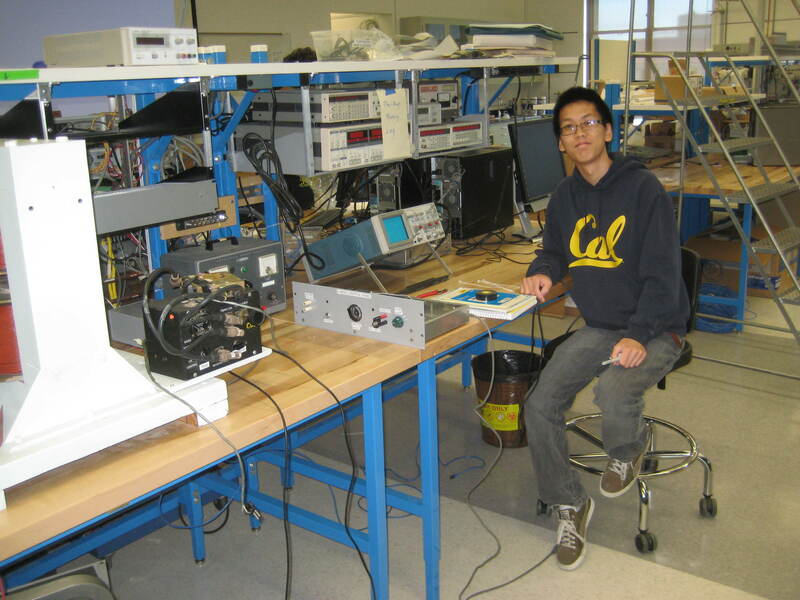 Once the modifications were complete, Adam wrote a program in LabView to generate pulses and perturb the negative feedback control of the laser and developed procedures for students to use. 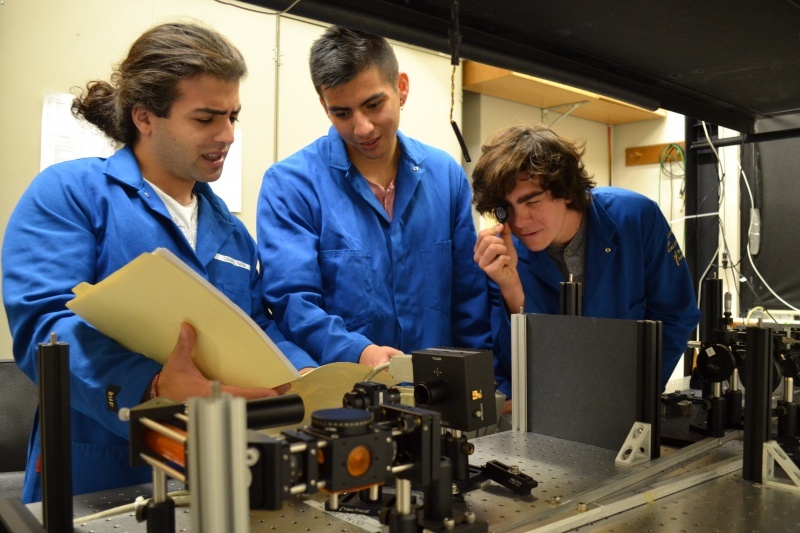 Segre interns were the first to try the new optical trapping experiment, and ended up rebuilding some of the optics. Development and testing of the Optical Trapping experiment, rebuilding Muon Lifetime Experiment to replace analog signal processing with all digital processing and analysis, upgrading Compton Experiment, testing and revising Brownian Motion in Cells experiment. Assembly and testing of magnet and cooling circuits for Atom Trapping experiment, relocation of Brownian Motion in Cells setup and setup of new Optical Trapping station, developing of new wiki for advanced lab writeups.